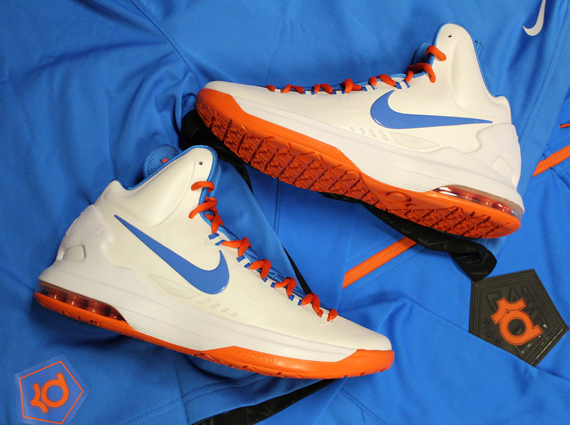 The KD V continues to break into the new year on a high note with the release of this OKC Thunder home colorway scheduled for later this month. Already seen on Durant's feet several times this season, the KD V puts on display a traditional combination of the Thunder's team colors. A white base is hit with photo blue accents over the Swoosh branding, lining and tongue, while team orange takes care of the laces, heel Air unit and outsole sitting below. The OKC Thunder "Home" Nike KD V is scheduled to release January 19th at authorized Nike Basketball accounts such as Rock City Kicks.